On the 21st of April 2006 Geoff Spooner, the son of Commander Spooner RN Rtd, wrote to me with a fascinating account of the events leading to the sinking of the Admiralty Floating Dock 26 and the resulting damage to the HMS Valiant. At that time Commander Spooner was Executive Chief Engineering officer in HMS Renown and was present at the time of the event. I requested permission from Geoff to publish his letter but he requested more time to discuss the incident with his father and to provide a more definitive and accurate account of what really happened. Finally on the 27th of November 2007 Geoff corresponded with me again and provided the following, quite amazing, description of the AFD26 sinking as narrated by Commander Spooner RN Rtd. 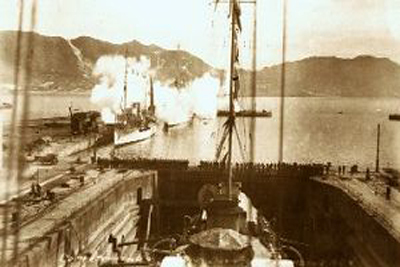 DiveSriLanka.com is very grateful to both Geoff Spooner and Commander Spooner RN Rtd for the effort taken to shed light to this very significant event in the naval history of Sri Lanka and granting us permission to publish the story. If I may, I would like to make those additions and corrections to the account of events surrounding the sinking of the Admiralty Floating Dock 23 on August 8, 1944. My father is still strongly independent and will be 97 this December 2007. He has given you his blessing if you wish to publish, or recount, or not , his recollection of events leading up to the sinking of the Admiralty Floating Dock 26 and the events that occurred during and after that fateful night. The events and vessels that sank prior to the sinking of the Admiralty floating dock 26 are probably of no interest to you as they occurred in the convoy from Durban to Trincomalee. The Khedive Ismael for example, a troop transport, carrying nurses and medical staff, was torpedoed by the Japanese submarine I-27, and sank in waters that you would not be diving. Above left is a picture of HMS Valiant in dry dock. Apparently it was taken in 1944 during the time that she was part of the East India Fleet by a Naval rating serving in her. However, it may or may not be the Floating Dock in Trincomalee. If you can identify the surrounding landscape from the known position of the sunken dock, then maybe you can verify that this may very well be a rare photograph of the dock not long before it sank. I used Google Earth satellite imagery and believe that this picture is more likely to have been taken in the Port of Durban. 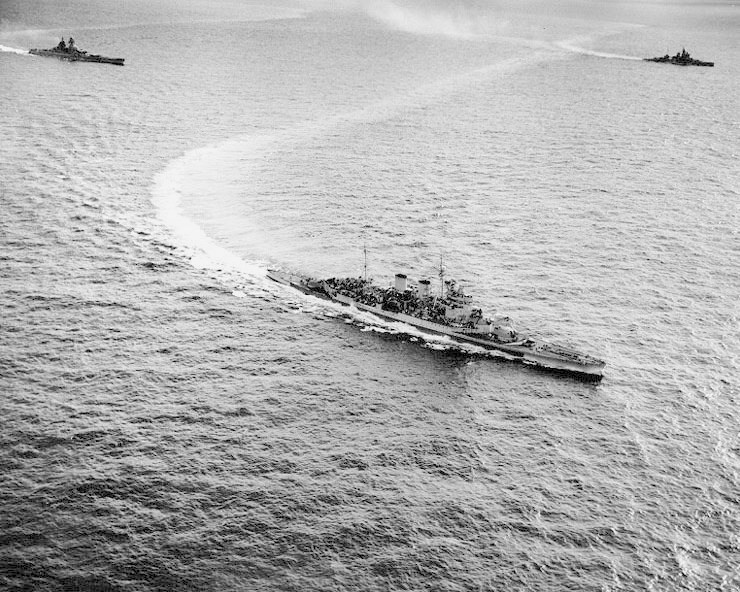 The photo below, taken by a reconnaissance CV-3 plane from the USS Saratoga on 12th May 1944, shows HMS Renown - centre, Richelieu L and Valiant R. All four ships were in Trincomalee while Valiant was to be dry docked for repairs and anti fouling. (NOT as previously mentioned from a collision with HMS Warspite. That was in World War I !) Also in port that night was HMS Queen Elizabeth, sister ship to Valiant. As my father recalls more clearly, it was the then Vice Admiral Arthur John Power to whom he was reporting that night (who's flagship was HMS Renown) and for whom he had the responsibility of escorting to and from the dry dock and assessing damage and possible salvage. Because HMS Renown was due to use the dock for anti fouling, my father had previously boarded the floating dock to familiarize himself with all of the controls and operational procedures. On the night of August 8th 1944, by the general list of the Dock, it was apparent that all was not well. Upon boarding the dock with the Vice Admiral, my father went straight to the control room only to find no one at the controls. He immediately realized that the sequence of pumping out the ballast tanks was inappropriate for HMS Valiant, being short, weighted amidships but more importantly, being fully loaded with ordnance. Apparently the operators did know that HMS Valiant carried most of her weight amidships but did not know that she had a full load of ordnance. They therefore began by pumping out the mid dock tanks first. Too much weight fore and aft and too much lift amidships caused the dock to break its back upwards. Recommendations were made but too late to make any difference. After having assessed the situation, Commander Spooner reported to the admiral, (both of whom were on the dock), saying, "If you want to leave with dignity, I think we should leave now Sir", to which the Admiral responded, "Nonsense Spooner, nonsense" and proceeded to walk on the dock away from the launch. A few moments later, the dock began to list more heavily.The Admiral bumped into Commander Spooner on his way back to the launch. They both promptly boarded the launch and as the Admiral stepped onboard, there was a loud crack as the dry dock broke its back. HMS Valiant apparently still had a head of steam and although her stern gear and stern hull plating were seriously damaged, the ships company was able to save the vessel as the floating dock continued to sink. The damage however was too severe and she never saw active service again. As far as the Dock is concerned, my father's recollection of the events and conversation with the then Vice Admiral are correct. There is a small addendum with regard to one of the giant cranes that ran on railway tracks aboard the floating dock. After my father left to return to HMS Renown the ailing dock was only visible by the searchlights aimed at it from the surrounding destroyers. At one point after the dock had broken it's back, the angle of the deck was such that one of the dock's giant cranes began rolling down the tracks picking up speed until it ran off the tracks and into the water. I understand that there was a salvage effort by a French company around 1968. It sounded as though the dock had been completely salvaged although that doesn't ring quite true as I also recently read somewhere that it is forbidden to dive on the wreck or site? Maybe you can shine some light on the subject? In any case, there may still be a crane nearby the site? My father does have quite a collection of photographs of his Naval years from Scapa Flow to the Yangtze Chiang. There may even be one or two from Trincomalee. I shall look through them and let you know. 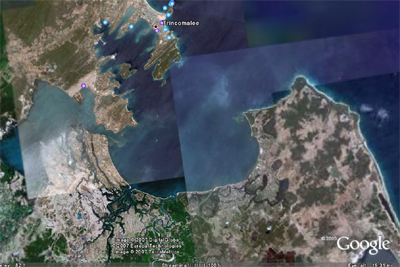 Just as a footnote, I noticed that by using Google Earth Satellite imagery, it is possible to make out a couple of wrecks within the harbor at Trincomalee. I hope that all of your diving ventures and your spirit to protect the natural beauties of this world will continue with success. Photo Credits: Provided to www.DiveSriLanka.com by Geoff Spooner. Map dispalyed is from Google Earth.